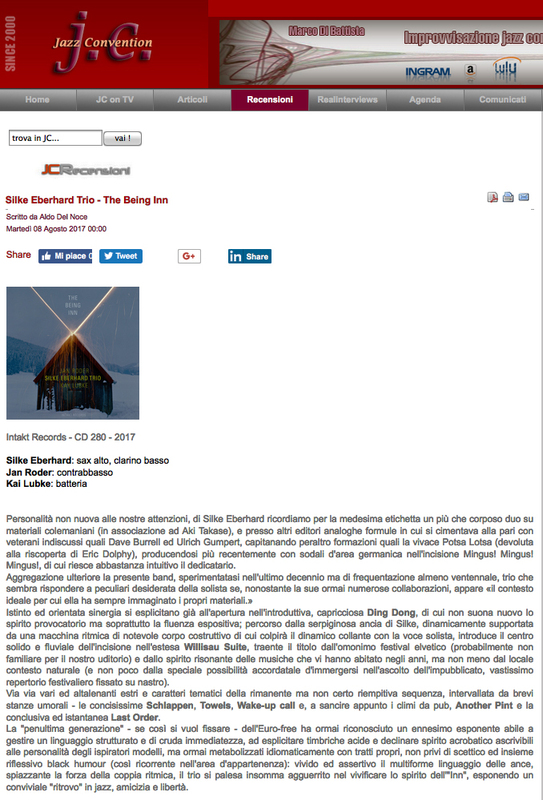 Die Intaktler, mit den 'Intakt in London/London in Zürich'-Festivitäten in den stolzen Knochen und zusätzlich bestärkt durch den Preis der deutschen Schallplattenkritik für "Sakura" von Aki Takase & David Murray, kehren ins alltäglichere Geschäft zurück mit The Being Inn (Intakt CD 280). Was will uns das neue Geschwisterchen von "Being" (2008) und "What A Beauty Being" (2011) sagen? Dass nicht Sprache, sondern Musik das Haus des Seins ist? Und sich bei näherer Betrachtung als Kneipe erweist, in der 'Another Pint' und 'Versteckter Kitsch' gezapft, aber vor allem Coleman, Dolphy und Mingus ausgeschenkt werden? Vom Lübecker Berliner Jan Roder am Bass, den wir zuletzt ganz glücklich mit JR3 hörten, und dem Karlsruher Berliner Kay Lübke (von Hornbeef) an den Drums als bewährten Thekenkräften. 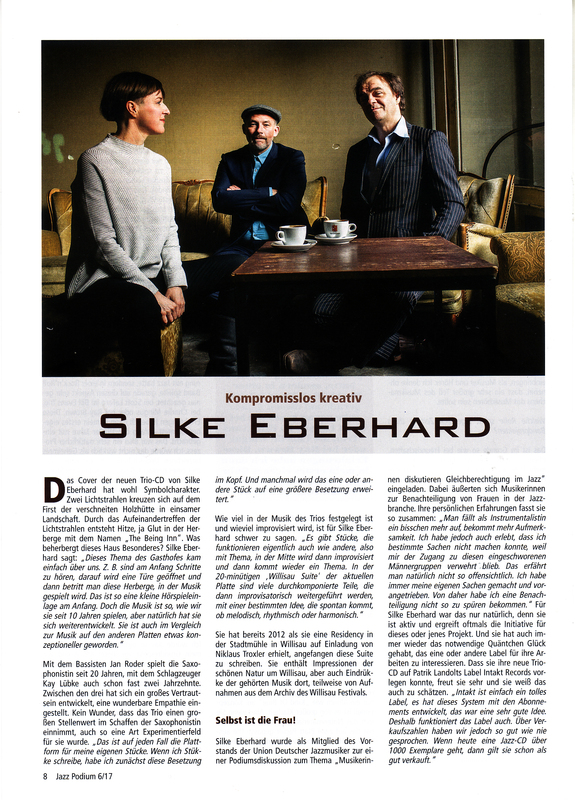 Mit Silke Eberhard, einer nicht gerade typischen Prenzlschwäbin, die mit Altosax & Bassklarinette und mehr als Freundin denn als Chefin den Ton angibt. Sie schreitet - hörbar - zur Tat, aber dem zu 'Take Five'-ähnlichem Groove gekrähten 'Ding Dong' zu Beginn folgt nicht 'die Hex ist tot', sondern die 18-min. 'Willisau Suite'. 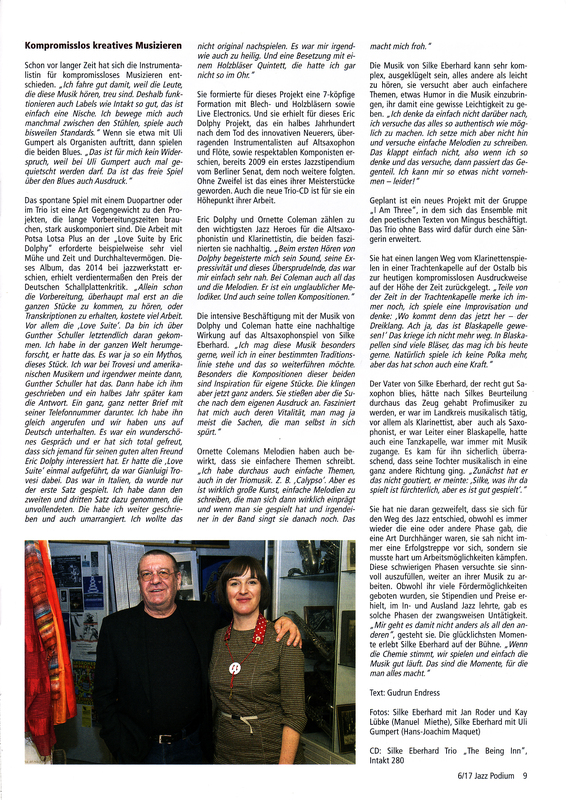 Die Hommage an Nikolaus Troxlers Lebenswerk mischt Schweizer Impressionen mit jazzgeschichtlichen Reminiszensen, mit markantem Bogenspiel, rollendem Drive, joggendem oder scharwenzelndem Pizzikato, flippernder Perkussivität, ostinatem Stau und all der kapriziösen und gepfefferten Sangeskunst, zu der Eberhard geradezu altmeisterlich fähig ist. In der anschließenden Lang-Kurz- / Bier-Schnaps-Folge flotter Cheerios und kleiner, sich gleichender Intermezzi auf ex kommen 'Schlappen' und 'Kanon' mit Bassklarinette daher, 'Miniatür' filzweich und mit Besen­strichen. Aber warum die vertrackte und freigiebige Spielkunst der drei verkürzen auf hier ne Repetition (die wie vor ner roten Ampel auf der Stelle tritt), da das raffinierte Wechselspiel von tanzenden Lippen, Fingern oder Stöcken und dort ein Tirili - meist ja schon innerhalb eines Stückchens? Eberhard zeigt sich im spritzig Liquiden forellig wohl und singt auch noch, wenn bei 'Schirm' dunkle Wolken wankend näher rücken. Der Kitsch allerdings, der fällt, schnipp-schnapp, der Schere zum Opfer. Lieber noch n schneller Absacker... - Aaah. 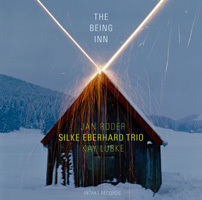 A working concern for over a decade, Silke Eberhard's ensemble with bassist Jan Roder and drummer Kay Lübke contains connective collaborative tissue dating back a decade earlier than that. It's testament to the vagaries of improvised music that they've only managed to mint three albums over that time span. The Berlin-based reedist's influences are a mix of historically intuitive (Dolphy, Mingus, etc.) and contemporary, the latter manifesting mainly through meetings with pianists Aki Takase, Dave Burrell and others. 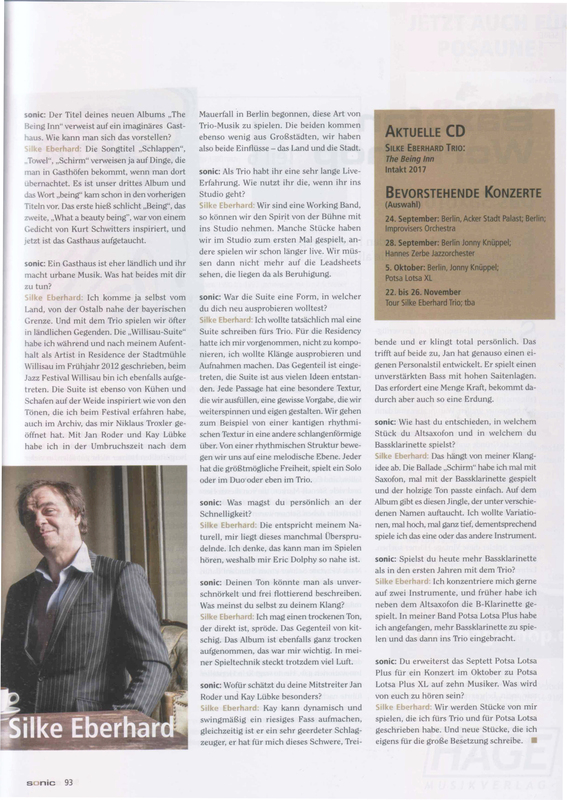 Roder's resume is reliable and extensive, his highest profile gig as the strings center for Die Enttäuschung in the company of Rudi Mahall and Axel Dorner. Lübke's been equally prolific in sideman roles since the changing of the millennium. 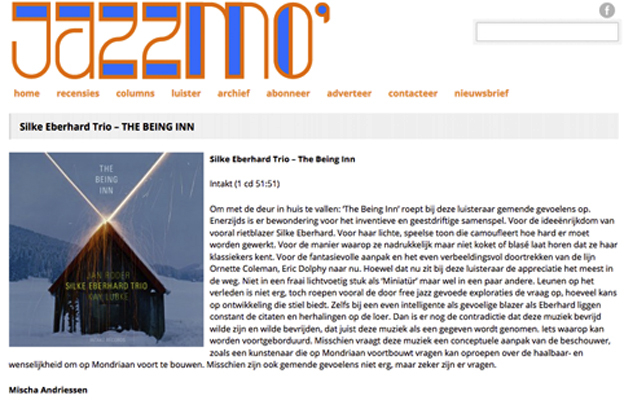 The Being Inn is a concept album and for that fact something of a rarity in the realm of free jazz. Eberhard brings together a dozen of the Baker's dozen pieces around the unifying theme of a fictional bucolic hostelry. Interstitial fragments alternate with longer pieces in painting an aural portrait of the edifice and its environs. "Ding Dong" opens with the sound of footsteps and the opening of a door before launching into a brisk sortie balanced on a revolving groove. "Towels" and "Wake-Up Call" point to amenities at the potential lodger's disposal, each packing a frenzy of activity into their terse half-minute dimensions. 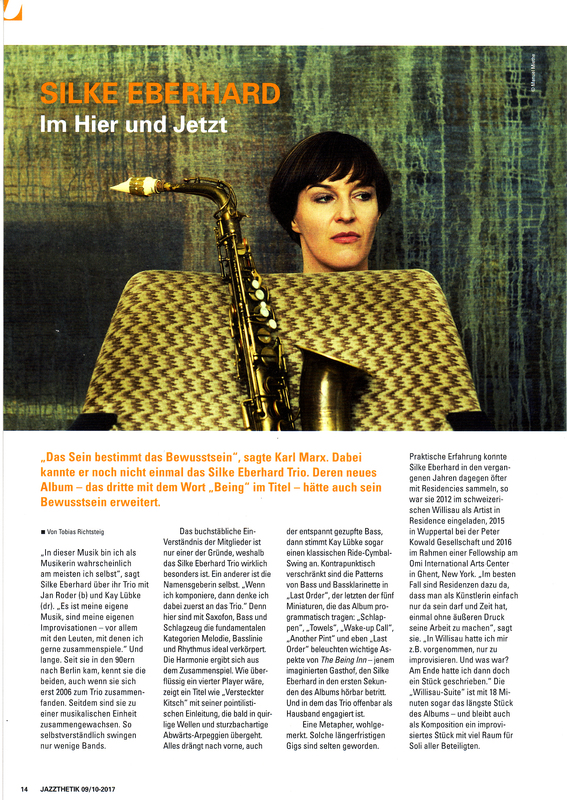 Eberhard's avian alto alternates with full-throated bass clarinet, riding the choppy cross-rhythms conjured by her colleagues while keeping a loose tether to melody. Apart from these brisk and colorful sketches sits the eighteen-minute "Willisau Suite" and an extended opportunity to hear the trio deal with a long form balance of composition and improvisation. While specific to this trio in their application, the techniques and devices employed by the three players in concert and isolation will be familiar to anyone familiar with jazz-based improvised music. Cognizant of that precedence Eberhard illustrates a tactic true of the best artists in the idiom. What is played often becomes secondary to how it's played. 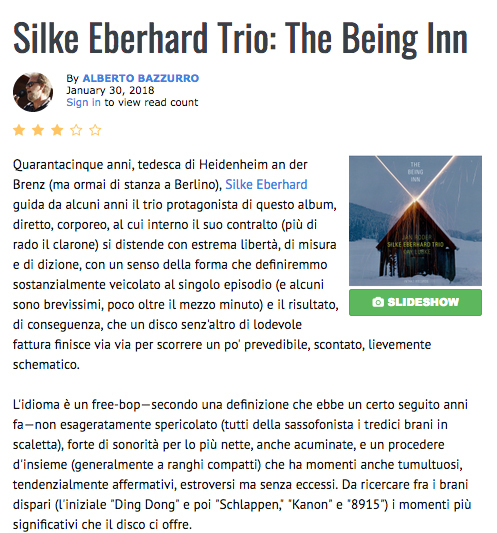 Eberhard's agility and facility in voicing a line is formidable, but it's the clarion plangency of her tone that sticks most tenaciously in the memory. A double entendre hidden in plain sight in the album intimates another truth of this trio and its music. Being in the moment, in the performance together is paramount and the fulcrum on which a satisfying result rests. 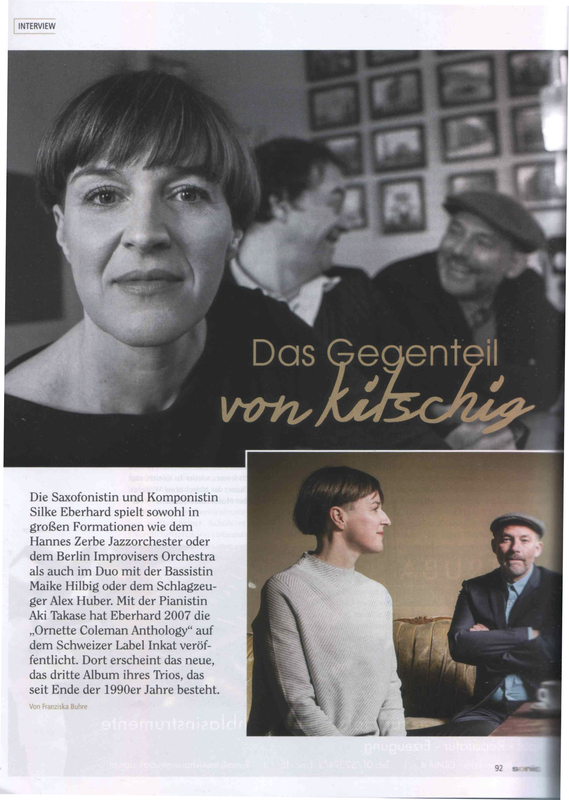 Silke Eberhard reflektiert gern die Klassiker der Jazzmoderne. 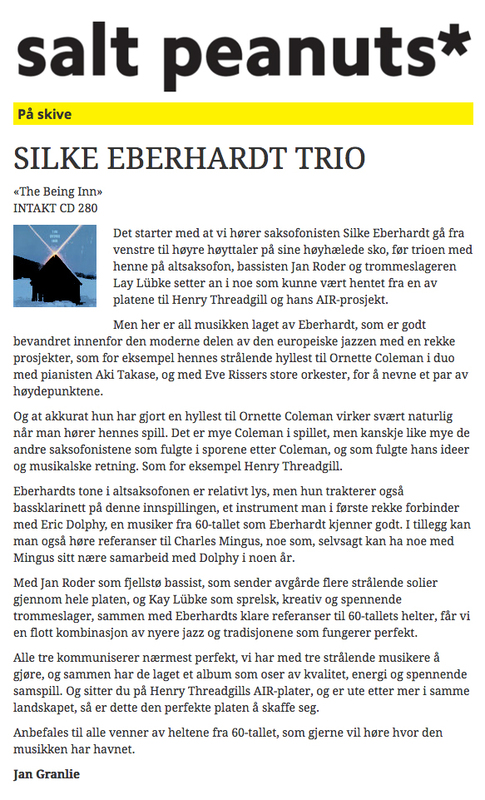 Mingus und Dolphy gehören dazu, mit der Pianistin Aki Takase hat sie, ebenfalls auf Intakt, eine Duo-Platte zum Thema Ornette Coleman gemacht. Nun legt sie im Verbund mit dem Bassisten Jan Roder und dem Drummer Kay Lübke eine Trio-CD vor, die ausschließlich ihre eigenen Stücke enthält. Da sind Nummern dabei, die nicht einmal eine Minute dauern, kurze Einwürfe, die viermal das gleiche, fast schunkelnde Thema in unterschiedlicher Instrumentierung bringen. Dabei wechselt Eberhard zwischen Altsax und Bassklarinette. Aber es gibt auch ausführliche freie Exkurse wie die fast 20-minütige Willisau Suite. Da können Roder und Lübke auch ihre Fähigkeiten als antreibende, swingende Begleiter ausführlich unter Beweis stellen. Das bleibt auch weitgehend ihre Rolle, ein wenig reduziert, aber mit Präzision und Engagement umgesetzt. Die Stücke Eberhards haben Charme und Witz, die Titel sind manchmal ein wenig kokett, bei Versteckter Kitsch muss man den Kitsch wirklich intensiv suchen. 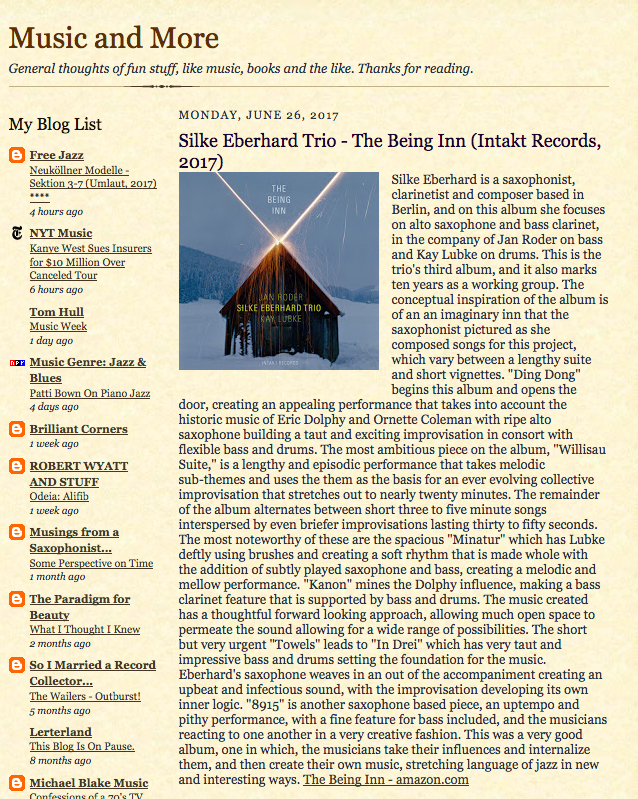 It is difficult to not recognise Silke's personal touch for someone like myself who is so familiar with her recordings. Accordingly the reason for that is exactly this tradition following path she continues to step on. As a die hard fan of Dolphy's, Coleman's or Mingus' music I am finding the natural consequence in what she is doing. Additionally the fact that she made another recording with trio she long time co-operates with guaranties the flow that I like so much in her music. It took ten years to get back to Intakt but it was same worth awaiting for as it was a duo she debuted there with. Following Willsau Suite is a longest piece on that set and it possesses this looseness in form suggesting it being vastly improvised. Silke leads here doubtlessly and the section follows with great feeling. Everyone has enough space to include the solo into the tissue. As well as contribute into fast running ideas coming to the table. Roder's Bass sounds wonderfully natural walking with such a feeling of pace, which adds vastly into highly imaginative sax lines. The way the Drums comes together with framing space-scape embracing sax cannonades She blows out is nothing but genial. Here is where complete Lubke's Tour de Force takes place. And walking with Silke like that takes a lot of guts, believe me. This is also the best piece on here. Hugely imaginative and with quirky sense of humour. And some dirty jokes had being said between the lines too. Here tears and laughs merge into one. Tensions find perfect culminations and then realise back into an open space. Funky named Mininatur explores the series of pictures gently sketched by Silke's sax underlined with fat and dance bass walks. All that on the carefully brushed percussive background which is like a snowy-white page for them. This, then 8915 and Verstecker Kitch are all reminding me the mood present in Arthur Blythe & David Eyges collaborations. Or Julius Hemphill with Abdul Wadud, but obviously spiced and energised with Eberhard's own temper. Ogh,…Yammy ! The Kanon, beautifully looped into the rhythmic repetitions from the section is a Bass Clarinet bravado wonderfully executed, but also highly demanding on partnering musician's empathy and musical imagination. My absolutely 2nd best here. It continues in further triumphal clarinet walk in the Schirm. A dark suspense-ish theme stepping into the fade like Davis' tunes composed for The Lift to the Scalfold, an iconic French Noir Movie. This is fantastic recording which I continue to return to and listen for more. You wouldn't believe how many layers are still waiting there to be revealed. That made one great soundtrack to ongoing holiday laziness spiced with an intriguing intellectual twists.